Sometimes you don’t want to just carry a pocket pistol. Instead, you want to be able to feel the weight of that 1911 as you walk around, and hear it clunk on your nightstand when you take it off for the evening. You just want to carry something big. Well, Something Big – Within Reason. Now when most people think “big gun,” they think 1911 or a long barrel revolver, but unless you’re the Joker, you probably aren’t going to carry a Smith & Wesson 500 Magnum with the 6.5-inch barrel or a full-size Desert Eagle. Instead, you might want to carry a Glock 17, H&K VP9, Kimber Stainless II 1911, or something similar. While some of these have shorter barrels than others, they are all full-size guns, and none of them are small. Concealed Carry 1911. Because You Can. Of course, carrying a bigger gun brings a different set of challenges that you face when you carry a subcompact or even a compact handgun. To help you out, this article is going to go over some of the things you’ll want to consider when you are thinking about or having trouble carrying a big gun. Now, as you read below, it may come across like carrying a big gun is not a good idea. That’s not the case at all; it’s totally up to you what you carry. I do, however, want to discuss the pitfalls of carrying a big gun so you are aware of them before you go out and spend 1200 dollars on a sweet 1911 and realize you can’t appendix carry it like you saw in a movie. Let’s compare some guns so you can see the size difference. 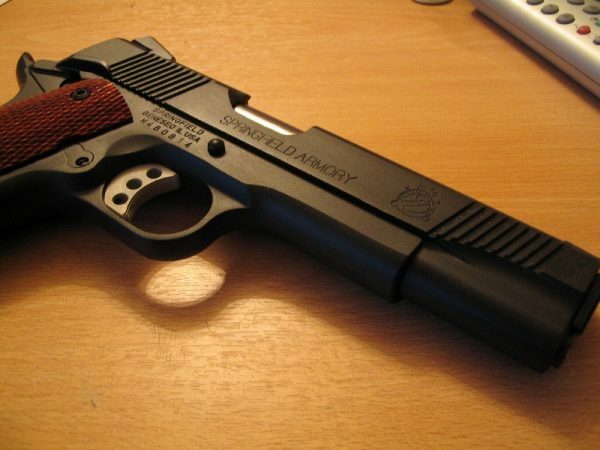 Compared to something like the Sig P238 in .380, a standard 1911 is 3.4 inches longer and almost twice as thick. Even compared to a Glock 36 (their .45 ACP subcompact) you aren’t gaining much other than more gun to carry around. Is one round worth hauling around the extra 15.5 ounces? That’s almost an extra pound… for one bullet. So what do we gain with the bigger gun? For starters, you get a slightly larger round if you go with a 9mm version of the Kimber. 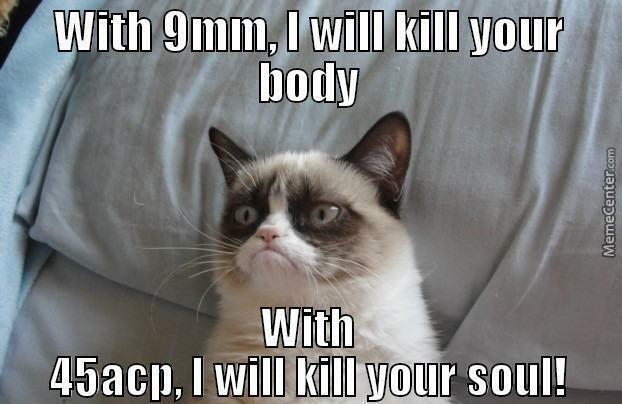 But, if you are carrying a 1911, most wouldn’t bother with 9mm and instead, go with the .45 ACP. This gives you a much larger round, obviously. So yeah, you get one more bullet with the .45 ACP version, but the gun is almost twice as wide. It’s even wider than the Glock 36 which is 1.10 inches wide and holds 6+1 rounds also. 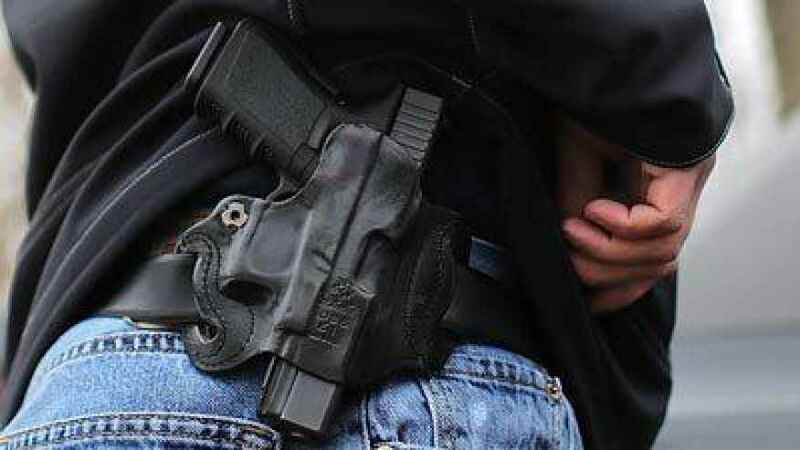 Now that you know what you’re getting into, let’s talk carry positions for your big CCW gun. Your carry position will greatly depend on your body type. 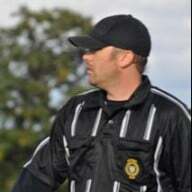 For example, if you are 5’11” and weigh 180 pounds, you’re more limited than a guy who’s 6’5” and 280 pounds. Of course, your clothing choices will also play a large part how and where you carry a big CCW gun. Do you wear tee shirts all the time? Do you wear a jacket and dress pants? A smaller frame pistol will be easier to conceal in the summer and in thinner, tighter fitting clothing. Furthermore, your full-sized gun isn’t something you’ll want to carry in an ankle holster or even appendix carry. It’s not going to be comfortable and is unlikely to even fit in the first place. All that said, let’s look examine what options you do have. Depending on the occasion, you could wear a jacket. 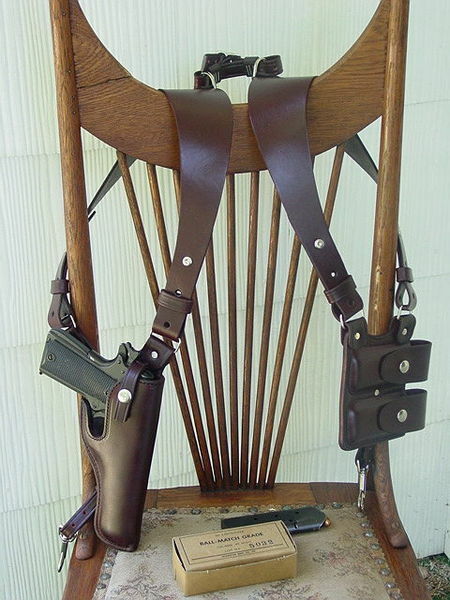 This would allow for an OWB holster anywhere from the 3-6 o’clock position. 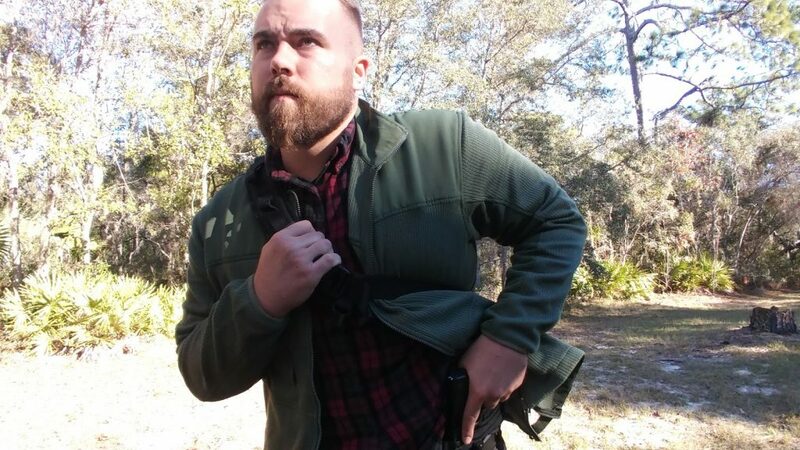 Most jackets will easily hide even a full-size gun in a holster. Plus, even if you are able to comfortably carry your sidearm of choice in an IWB holster, adding another layer of loose-fitting clothing will help you ensure that you won’t print. If you do choose to use an OWB holster, be sure not to keep it in a spot where it can easily be accidentally exposed. Making sure your gun isn’t an attention grabber will also help. If you have a nickel plated something or other with a mural painted on the slide, it’s going to be a lot easier to spot if your jacket opens in the wind. Black gun, black holster, black pants; even a darker shirt helps. And, of course, just keeping your jacket zipped or buttoned makes a huge difference. If black isn’t your thing…check out our Gray Man Loadout. A shoulder holster is an alternative to a waistband holster if you are wearing a jacket. This kind of holster isn’t for everyone though. Those of us who have a thinner build might need to position the holster more to the vertically to hide the gun. Regardless, the barrel could poke at the rear of your jacket or the grip might print out the front. When holstering your gun under your arm, make sure you practice your draw. If you aren’t accustomed to it, you may fumble or have an otherwise difficult time if you need to pull your gun under pressure. This also goes for t-shirt holsters. An IWB holster is also an option. Like a shoulder holster, using a holster inside your waistband will really depend on your body-type. You will also need to make sure you wear the appropriate clothing to conceal your gun. A tuckable holster can help when you aren’t wearing a jacket or some other outer layer like a sweatshirt. The position of your carry will also greatly depend on your body shape. If you are on the leaner side, you will probably need to carry at the 4 or 5 o’clock position. If you have a little more mass to you, the 3 o’clock position might be easier for you to hide and still draw your gun easily if you need it. 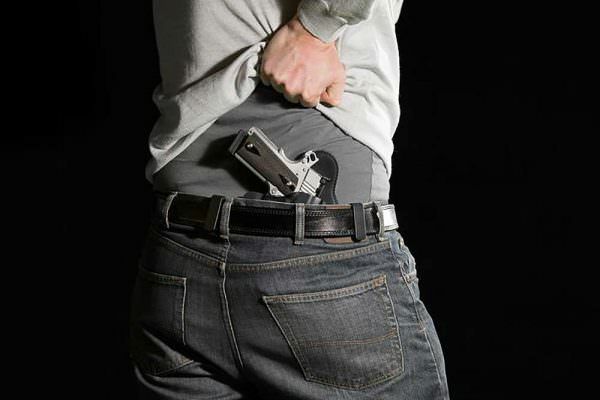 We can help you find the right IWB holster for you in our Best Concealed Carry Holsters review. When you choose the gun you are going to carry every day to protect yourself, you need to make sure you can handle it well, so be sure to consider why you want to choose a large CCW weapon. I prefer to carry for safety, but don’t like to have the inconvenience of a large gun where I need to change the way I bend or move or wear different clothing. On the other hand, some people prefer the feeling of security that goes with a weightier weapon or feels more confident carrying a larger caliber. Looking for more options? You should take a look at our other Best CCW Guns articles, we’ve looked at a huge range of guns from full-size to revolvers to subcompacts. What about you? What’s your CCW sidearm of choice? What are your thoughts on big guns for CCW? Have any advice for those looking for concealed carry larger sidearms? As always, share your thoughts in the comments! Most of these carry discussions don’t address what most of us do everyday. Driving. The only way I found to quickly access a firearm while in the driver’s seat is weak side so the seatbelt lock isn’t in the way of the draw which is anathema to concealing a full sized pistol. I have carried both a full size 1911A1 and a Commander Concealed and on duty open carry. I prefer something smaller and lighter but it can be done. I carry my Colt Gov now open carry when I ride Horseback. I am 5′-10″ and 249lbs. I own a S&W M&P Shield Performance Center .40, 7+1, 3.1″ barrel and a Springfield Arms XD-M 3.8″, 16+1, .40. I wear either one concealed using an Alien Gear IWB holster. They are both very comfortable sitting or driving when worn in the 4 o’clock position or the 10 o’clock position in a right hand cross-draw. I actually prefer the XD-M.40 when driving and traveling. Hopefully this will help.